Oftentimes, humanity has been tempted to act on premises based on eugenic elitism: allowing those who are most skilled and able to reap the greatest rewards. However, these kinds of social projects must irremediably confront a fundamental fact: that human life is not defined by one's aptitude for survival but rather by the unrestricted desire to live fully. Though social projects based on efficiency and competition have been highly praised, it is clear that human life requires the mind's power of symbolic creation in order to continue being precisely that - human. Indeed, even under the most precarious of conditions, imagination keeps guiding us along the diverging paths of existence, focusing at once on the urgencies of survival and the categorical imperative of desire. And there, in our innermost consciousness, what matters is not the prerogative of efficacy but the need impelling us to contemplate the meaning of life and things. This ubiquitous imperative subsists in the deepest recesses of our spirit. When is it born? Perhaps at the same time as life itself, because it is the most primary of symbols: living is a semantic endeavour. Symbolization is a phenomenon exclusive to human beings and has nothing to do with processes of adaptation and survival. However, as strange as it may seem, intelligence does not come to terms with actual human need as it does not render human beings more suited to life but rather only deals with solving problems. Indeed, one must have something more than just abilities in order to live, one must want to live. And this can only be done through meaningful associations which are the product of symbolization. The symbolic is present throughout our lives. We can sometimes do without concepts, tools or vital resources - if only briefly - but we can never disregard the symbolic. It is thanks to symbols that we can perceive the world as a space of human creation. The work of fostering the creativity of people with Down syndrome bears an obvious relation to this. In our country and culture - an extraordinary blend of traditions - there is a noticeable predisposition for symbolic creation. Mexican children have a marvellous, almost innate perception of a world flooded with colors, textures and flavors which makes them greedy for sensory experiences. This, added to a family environment filled with traditions, myths and legends, means that our work has, more often than not, found fertile ground. The most important conclusion we have reached may still clearly depict the prejudices and schematic approach with which we have stigmatized and belittled people with Down syndrome: why are we surprised that they are able to create works of art? People with Down syndrome have taught us to see life on a more profound level: if we live with them and manage to understand their way of perceiving the world, we will see that they provide a revealing incitement to reorder our life values. Behind their visible shortcomings emerges the power of the human spirit - a creative ability that transcends intellectual mechanics and imbues things with a light of its own: the unrestricted enjoyment of life. These individuals show us that human life is not reduced to skills and aptitudes, but rather that it rests upon a process of self-generation that allows us to transform the immediate into desire and to identify this process with that curious destiny known as a calling, rather than with the mere achievement of goals. People with Down syndrome, moreover, are a sign that permits us to understand human coexistence beyond the spheres of narcissistic self-affirmation and fierce competition. They have an innate ability to enjoy life that does not require a comparative measure. They do not know much about themselves given that they have no urge to compete or compare; they are aware that they are different though they do not claim to be better than others for this reason. They have the will to transform and create, but do not define themselves as artists because of it. This is why, essentially, the life of a person with Down syndrome can express itself fully, given that he or she is able to signify, understand, love, desire, enjoy, create - in a word, live. Thus the disposition for symbolic creation and, at the same time, the marked difficulties that most of our students have in mastering language led us directly onto the daring path of art making. The John Langdon Down Foundation was created in Mexico on April 3 1972, as the first institution of its kind in the world dedicated to providing care and education to people with Down syndrome and their families. Over thirty-two years of uninterrupted service, the foundation has developed various programs to improve the quality of life of people with Down syndrome. Thus, in 1993, The John Langdon Down Foundation created The Mexican School of Down Art as an initiative promoting an educational model based on the development of symbolic comprehension, expression and creation. It was at first a recreational activity in the form of a painting workshop where materials were restricted to paper, cardboard, markers, watercolors and crayons. 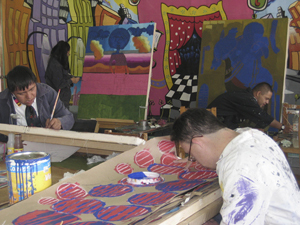 Subsequently, in 1995, after observing what had been achieved and the artistic potential of students, the Foundation created a more extensive educational program in the visual arts, comparable to that of many professional courses. 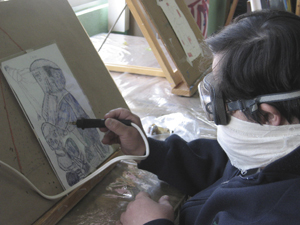 Thus, the creative power of people with Down syndrome could be more clearly expressed in the exploration of diverse materials and media (oils and acrylics, pastels, engraving). This allowed them to lend shape to work of great artistic value, similar in sensibility, technique and quality to that of professional artists: indeed, work that has been shown in prestigious venues in Mexico as well as abroad. The project achieved such relevance that in 1997 the Foundation formally established the Mexican School of Down Art whose program includes a wide range of theoretical courses and technical workshops in painting, sculpture and engraving. The artwork of the Mexican School of Down Art students has received the acknowledgment of renowned artists such as Rafael Cauduro, Raúl Anguiano, Juan Soriano and José Luis Cuevas, amongst others, and has been shown in diverse venues across the country and the globe. Among its most noteworthy exhibitions we should mention those hosted by the Vanderbilt University's John F. Kennedy Center, the University of Kansas' Institute for Child Development and the University of Colorado's UMC Art Gallery and the Boulder Museum of Contemporary Art, and also the show organized as part of the 32 Festival Internacional Cervantino in the city of Guanajuato, Mexico. 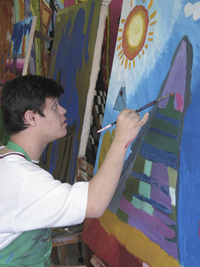 The Mexican School of Down Art is an innovative project proposing a new alternative for young people with Down syndrome to express themselves. 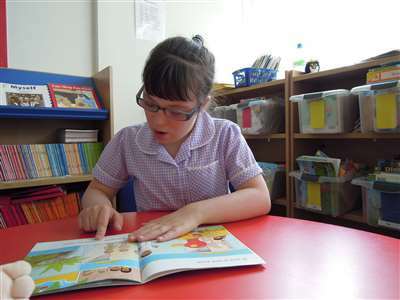 This valuable endeavour is the result of the effort of the John Langdon Down Foundation which instigated the School's creation with the firm belief that people with Down's syndrome have much to offer in the field of the arts. 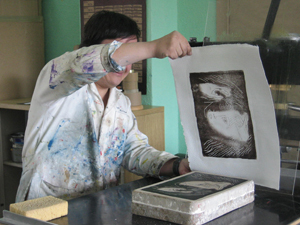 Fostering the development of a personal mode of artistic expression through visual art education. Motivating creative development and inventiveness by means of art work. Fostering artists' integration in the field through their participation in exhibitions, conferences and other art events. The John Langdon Down Foundation was started in 1972 as the first organisation in Mexico and Latin America devoted to the education of children, teenagers and adults with Down syndrome. The driving force from that time to the present day has been its President and Founder Sylvia Escamilla. She was inspired to start the work by her own son with Down syndrome Eduardo, who sadly died in childhood. Sylvia started with a class in one room and today the Foundation has purpose built facilities for a school, art studios, assessment and education facilities. It trains professionals and provides consultation to government, organisations and to parents as well as direct early intervention and school services. Sylvia started the international World Congresses - the first was held in Mexico in 1981 - and inspired the development of Down Syndrome International.